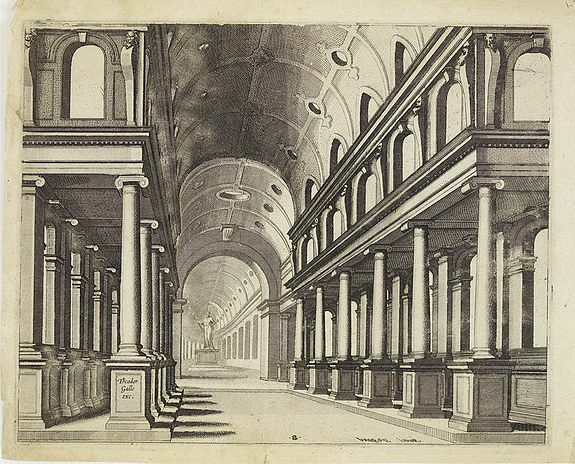 Description :Engraving after Hans, or Johannes Vredeman de Vries (ca.1527-1604), a famous Dutch architect and draughtsman, known in the Low Countries as "The king of architects". Later he has worked in Hamburg, Bremen, Danzig and Prague at the court of Rudolph II. At the beginning of the 17th century he returned to Holland and settled in The Hague. Published by Th. Galle. Condition : Good impression. Paper slightly age-toned, and some marginal light staining. Repair of small tear in lower part of print. Else fine.